Discover Canfield BHP is a one-day event for students admitted into the Class of 2023. The event helps students get a sense of what the program is all about, learn about life at UT, and meet current Canfield BHP students. 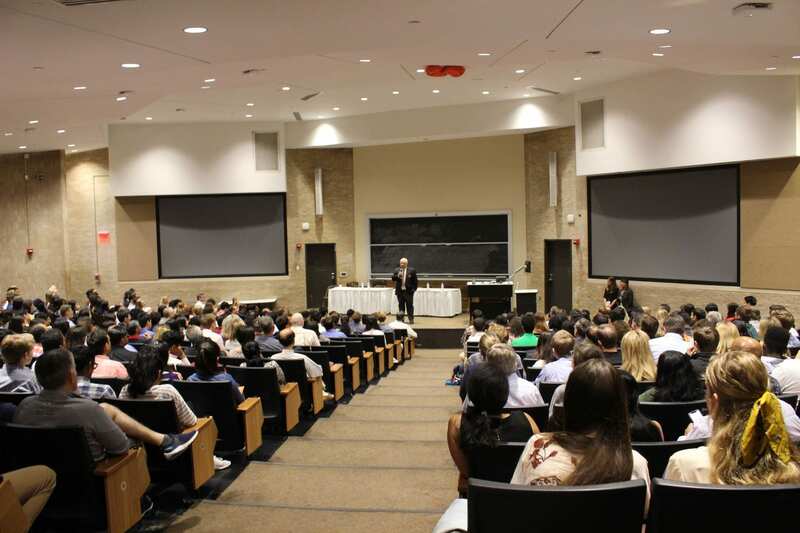 This year, the event featured student panels, mock classes, exciting speakers, and of course, time for newly admitted students to begin bonding with peers. 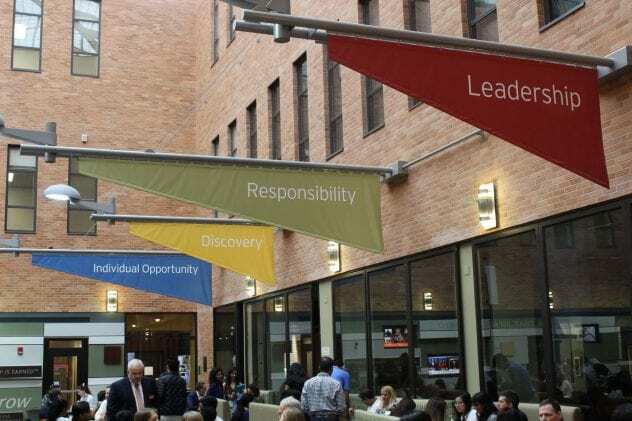 Discover Canfield BHP is a great opportunity for the incoming students to connect with their future peers and dive into the community of the program from the very beginning! One of the major talks during the day was given by the current faculty director, Dr. Andres Almazan. Dr. Almazan has had an extensive career at McCombs and joined Canfield BHP as director last year. In his address, Dr. Almazan welcomed the students and their parents. He emphasized that current students are not only driven to get good grades but are also extremely passionate about what they do, including taking time out of their day to volunteer and enjoy the overall Canfield BHP experience. 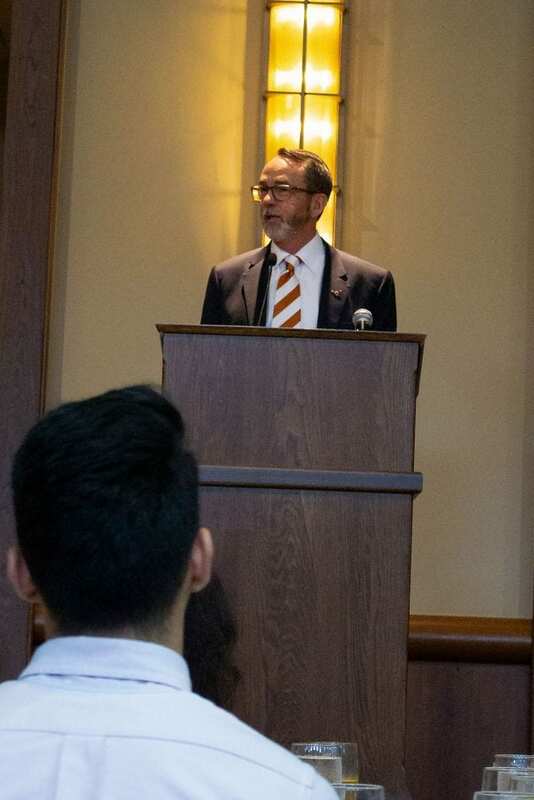 In fact, he noted that the involvement of student volunteers at Discover was a testament to their passion for the program and the type of leaders that come out of Canfield BHP. Next, Phil Canfield was able to join as the event’s keynote speaker in his first address since the program was named in his honor this past year. While Mr. Canfield covered a lot of different topics, one of the most interesting things he discussed was how his BHP education contributed to his professional career, and how that motivated him and his wife to ultimately give back to the program. He advised the prospective students to think about what kind of skills and community they wanted to get out of their college education. Leadership, he emphasized, was a crucial skill he developed in the program, and something he believed he wouldn’t have found elsewhere. He also stressed the uniqueness of the BHP community and the spirit of the program that creates a lasting network and camaraderie among the students. Q: You had two student panels: one for student life and one for careers & internships – what do you think was the most helpful piece of advice from each of these events? During the careers & internships panel, the panelists discussed the importance of the Canfield BHP network, which includes not only experienced alumni but also upperclassmen in the program. Oftentimes, current students will only think about doing informational interviews and networking formally with alumni, but it’s often easier to talk to upperclassmen, since they are more relatable and can provide more immediate insight on internship programs, career decisions, and more. The most important takeaway from the student life panel was the diversity of experience between the panelists. Each panelist had delved into widely varying college paths, whether that be Greek life, startups, fashion magazines, or study abroad experiences. The panel emphasized that the most impactful college experience comes from following your own passions and learning more about what you are interested in. 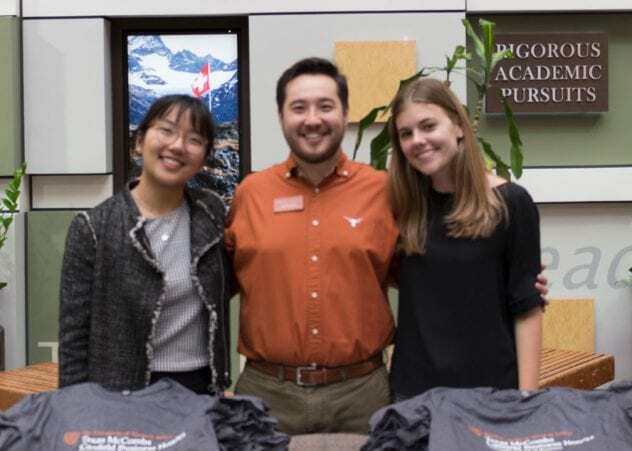 UT is a huge school with a wide variety of opportunities, and you can learn a lot from seeing what your BHPeers are involved in and joining orgs that speak to you! Q: What was your favorite part of the day? Annie: For me, I really loved getting to mingle with students during the morning. As much as I enjoyed learning about event-planning and organizing the event, in the end it’s all for the prospective students to have a great time. Even just in the 15 minutes I had to mingle before running to the next thing, I got to chat with a student who was interested in double-majoring in international relations (context: I’m an international relations double major!) and mingle with a group of attendees who all attended Austin high schools. Tatum: My favorite part of the day was lunch, where I got to sit and chat with prospective students. Like Annie, I think the best part of the event is talking with the prospective students and getting to share our experiences with Canfield BHP. I loved talking to my table at lunch and hearing about their passions in high school–a few of them were fellow band kids, like I was! It really meant a lot to me to get to meet them and share why I care so much about CBHP, which is why I love volunteering at Discover. Q: Can you recount how your experience was with Discover Canfield BHP 3 years ago? Annie: Discover Canfield BHP provided insight into the program that convinced me to come to UT and join this cohort. I told the prospective students this, and it was 100% true. I experienced the supportive community in BHP through the one-day event, which showed me that business didn’t have to be cutthroat and competition could be collaborative, even with people who are as brilliant and accomplished as the peers around me. This made me even more excited but also nervous about being a co-chair, because I felt pressured to make Discover as good as or even better than the day I attended. Q: How does it feel to be on the other side now that you are a student organizing this event? Honestly it felt kind of surreal to be the ones speaking during the introduction, running around making sure everything was in place, and ending the day realizing that we’d helped make a difference for the 300+ people that attended. During the process of planning, it was very cool to see all the different aspects of the event, and just how much work the office puts into Discover every year so that it can be successful. On behalf of the entire Canfield Business Honors Program, we are so excited to welcome the Class of 2023! After our successful Discover Canfield BHP event, we can’t wait for this new cohort to make their way to the 40 Acres in August. This entry was posted in Event Recaps, Events. Bookmark the permalink.